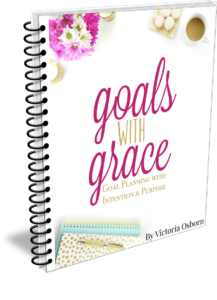 I’ve been writing down monthly intentions or goals to help me focus in on what is important. Many of the things listed are daily habits I’m seeking to maintain or grow in. The goal is not to obtain perfection, but to make steady progress…and months when there isn’t any progress, to give myself grace and start again the next month. That is my hope for you too as you strive to implement daily/weekly/monthly habits. Here are my monthly intentions for June. May seems to have come and gone so quickly. I’m not sure where the time went, and if I’m perfectly honest, most of my routines were off this month. I would say that all of my routines were more challenging in May – except making the bed! I kept that up almost every day this month. In June, I want to get back on track. It’s a new month and new resolve with it! You may have noticed a new “tagline” on my social media channels this past month. A tagline is the sentence or phrases under a blog’s name that usually summarizes what a blog is about. When I started blogging two years ago, my tagline was “Simplifying life one step at a time.” It perfectly summarized my intention for the blog at the time. I really wasn’t sure what the steps were going to be when I started blogging, but I knew the first step was decluttering. It continues to be about decluttering physical belongings, but it’s also about decluttering our schedules and our minds. It’s about creating space in our homes and our schedules so we can try new things curiously and see what “sparks joy” in our daily lives. It’s about doing less of the urgent and nonessential things, so that we can slow down and really focus our time and energy on what is important and most valuable to us. I write “we” here because I’m including you – the reader – in this journey. 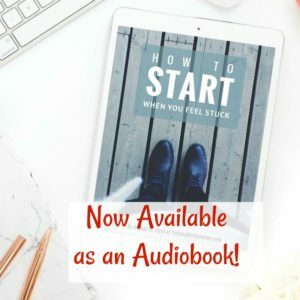 If you have been reading this blog, then I know you’re also interested in these topics, and I’m so grateful that you’re working through these steps as well. So the new tagline is Setting My Intention: Clearing Clutter. Finding Joy. Living Slow. My youngest son is playing rookie baseball for the first time and loving it! My heart is so happy when one of my sons finds something they are passionate about. Time outside hiking and camping with my family. As the weather warms up I’m hoping to start running again. Declutter the remaining two closets. If you can’t get out of the house for date nights, check out VidAngel . You can stream movies for $1. We used to use Redbox, but the convenience of not having to go out of the house to return the movie, is super convenient. 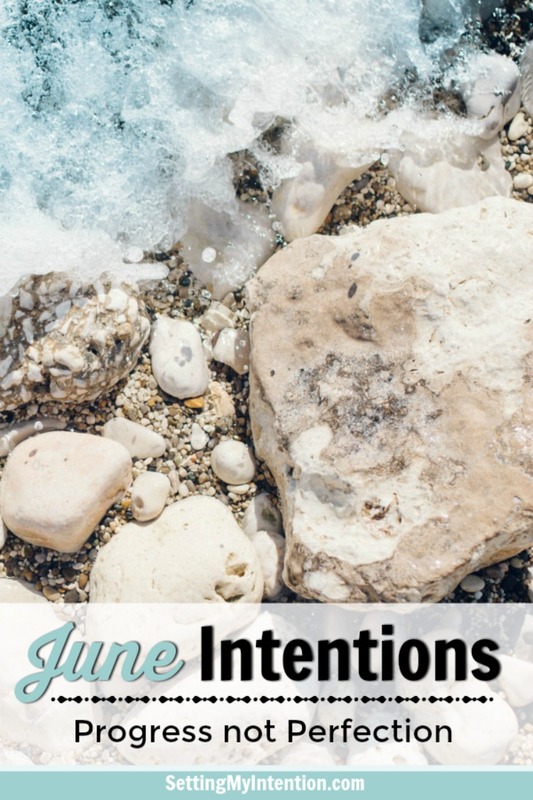 What are some monthly intentions that you have for June? Happy June Audrey! Summer break – yay! What a great goal to have during the school year. It sounds like you have great goals for June too – I love that idea of just getting out of the house every day. Great tagline! I too wish to clear clutter and to find joy in every moment. Angela, I think the new tagline is even better than the old one! And it was good! Where do you get all your rock pix?? Are they yours, or do you find them on the web? I usually use pexels.com or pixabay for free photos. Thank you Melinda! Clearing Clutter is a definite process and a journey. You’re doing great! I love your monthly intentions posts and no, I don’t know where May went either. I think it’s great you’re going to start tracking your time. I know it’s helped me so much in seeing how time was spent so I can see how well I’m balancing my work/life priorities and how I need to readjust for the next week. It’s not as hard as you think. In my Passion Planner, it’s already got the half hour increments so I just write down when I start a new task. I’ve gotten so used to it now that typically i just look at the clock and mentally note the nearest half hour I started the task. Then when I update my planner a couple times a day, I know when I started it. Best of luck in June! Thanks Tanya! I actually just started tracking my time today. I’m not used to it but doing the best I can!